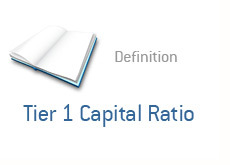 Tier 1 Capital Ratio - What Does It Mean? What is Tier One Capital? If you own a TV, then you have been bombarded with negative news over the past 6-12 regarding banking stocks. One term that you've almost definitely heard mentioned (and likely have no clue what it means) is Tier 1 Capital, or the Tier 1 Capital Ratio. For starters, this can also be called the Core Capital Ratio. Tier 1 Capital ratios are used by regulatory agencies to help determine the overall health and strength of a bank. "Tier 1 (core) capital consists largely of shareholders' equity. This is the amount paid to originally purchase the shares of the bank and retained profits (minus losses). Put simply, if the original stockholders paid $100 to buy their stock and the bank has made $10 in profits each year since, paid out no dividends and made no losses, after 10 years the bank's tier one capital would be $200. National regulators now allow several other instruments other than common shares to count in tier one capital, which are commonly referred to as upper tier one capital. " Other places have described Tier 1 capital as a bank's book value or corporate net worth.